Battlefield 1 is an impressive World War 1 game that challenges you to stay alive in an environment where bullets constantly fly all over the place. There are six classes of soldiers you can play as: Assault, Support, Medic, Scout, Pilot or Tanker. If you thought that playing as a horseman was a bad idea, recent gamers’ reports suggest you may want to think twice about it. 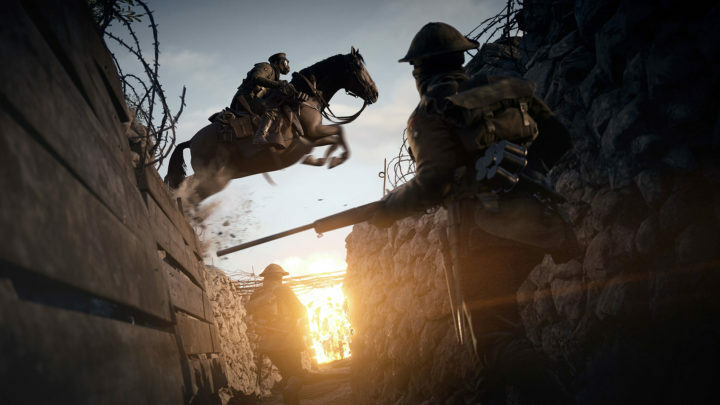 Many Battlefield 1 fans complain that cavalry are too hard to kill, and tens of rounds of bullets are necessary to gun down a horseman. Completely agree, today I saw 5 guys including me firing at and hitting a calvary man and his horse, and we all died by his blade and he rode off. I call it BS! When fighting against cavalry, you should shoot the rider, not the horse. His horse is equivalent to a vehicle, protecting him. One of the downsides when playing as cavalry is that the rider sits way up high in the air, which makes him an easy target actually. Also, horsemen have difficulties in turning the horse, and often get stuck on walls and other objects. Use these two elements to your advance when fighting against a cavalryman. If you’re out in the open, they have the advantage. If you’re near structures, you have the advantage. […] If you stand your ground, you best have good aim. Otherwise just run, but not the direction the horse is running, but to the side since they can’t turn well. You know, act like you’re a matador, and yell ole as the horse runs by and then proceed to shoot the rider in the back. However, many Battlefield 1 gamers strongly argue that the apparent cavalry invincibility is a real issue. Some players report that even after hitting the horseman in the head, the damage level is not enough to kill him. What my issue is that for some reason the cavalry guy is almost invincible. Sniper bullet to the chest that usually does 70+ damage? Cut down to 14. Why? I just had a game where this cavalry unit wasn’t even on his horse and I hit him in the chest with my martini henry and it was at the range where a one hit kills….14 damage? What the hell? What’s your stance in this debate? Do you think cavalry has an upper hand in Battlefield 1?